The ASD12-N and ASD25-N absorption sensors are designed for use in pilot and production scale fermenters or bioreactors to precisely measure the growth of microbial or cell cultures as a function of NIR absorption. A precisely defined and constant LED light beam penetrates the process medium. ASD12-N and ASD25-N use light from 840 nm to 910 nm (NIR). The attenuation of the light intensity, caused by absorption by dissolved substances and undissolved material is detected by a hermetically sealed photodiode. Models ASD25-N and ASD25-BT-N are designed for use in pilot or production scale fermenters or bioreactors. 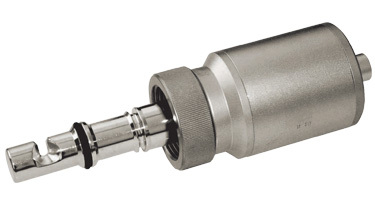 These extremely durable probes are designed for sanitary bioprocess environments and can be used in CIP/ SIP processes. The ASD25-N is conveniently mounted through a standard 25 mm Ingold –type port and the ASD25-BT-N through a standard 25 mm safety port.